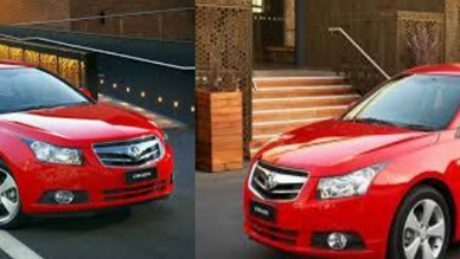 A thief has allegedly stolen a red 2010 model Holden Cruze sedan, registration 373 WEL from the front footpath of a home in Huron Crescent, Andergrove at about 3:05am on October 31. Fortune smiled on the thief as they found car keys inside of the vehicle. The car owner was alerted to the theft occurring as the stolen car was driven away from the address – the car has a very loud exhaust system. It has not yet been found by police – we are asking for your help. If you see the stolen car in your travels – please report it, don’t attempt to intercept the car yourself. 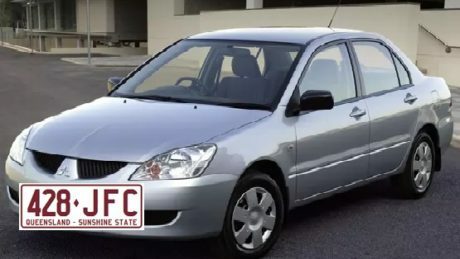 We encourage residents to share the image of this stolen car through your social media forums – the more of us looking for it the better. Anyone with information linked to this offence is encouraged to call the Mackay Northern Beaches police station on 0749 697 666 or Crime Stoppers on 1800 333 000 any time of the day. The police reference number is QP1701905352. Police strongly encourage all residents never to leave car keys inside of an unattended car – even if only for a short period of time. Murphys law – if you do it, that will be when a car thief is nearby. Police are investigating a shooting incident at South Mackay this afternoon. Around midday, police were called to an address at Eton following reports of a domestic violence incident. When officers arrived, they were advised a 33-year-old man involved in the alleged altercation, had left the property. Police attended an Amiet Street address a short time later where the man presented a firearm as he fled from the residence and it will be alleged he later discharged his firearm towards police during a foot pursuit. A short time later the man was located in a vacant block of land with what is believed to be a self-inflicted gunshot wound. He was treated by QAS on scene and taken to Mackay Base Hospital with life-threatening injuries. A number of crime scenes have been established with forensic and scientific officers attending. Anyone that may have been driving in Paradise Street or around the West Mackay area are asked to contact police. Police are also seeking any possible dash-cam footage that may assist with their investigations. It’s 20 minutes before the Choices team kicks off their presentation at Holy Spirit College – the decision in the image above is made to begin the warm up process. 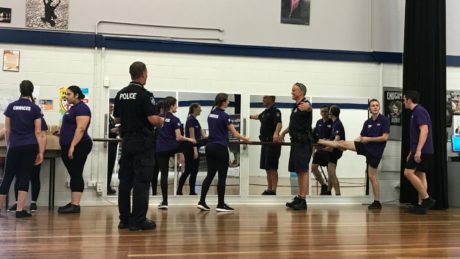 Some of the team spot the ballet bar and begin performing some warm up manoeuvres – Sergeant Nigel Dalton and I are invited to join in. Sergeant Dalton caves in and says yes – I hang tough and politely advise I am too old. It upset me that this wasn’t contested by the team. You’ll be pleased to hear no career change is pending for Sergeant Dalton. Krumping is his niche’. Not ballet. Our Choices team has performed 18 shows for 20 schools by the end of the day, working hard to prepare our district grade 12 students for Schoolies. Three more days to go until we are all done – the end is in sight. Aside from having a good belly laugh at some of the antics during the show – there are many safety oriented messages (assault/alcohol/drugs/road safety/domestic violence) and also “need to know” information directly linked to the Schoolies experience in the Whitsundays. A 62-year-old woman has died after being struck by a cane train in Mackay’s Pioneer Valley this morning. Initial information indicates around 10.45am the woman was undertaking work on MacGregor Creek Road as a locomotive assistant at the end of the train when she was crushed between two cane bins and pronounced deceased at the scene. The Forensic Crash Unit and Workplace Health and Safety are investigating. A victim’s deceased family member’s ashes, kept in tablets, are among a long list of stolen items following a burglary into a unit in South Mackay. Between October 19 and 5pm October 30 a thief has broken into a unit on Juliet Street in South Mackay by forcing the front locked door, likely by frequent kicking. Police are very keen to speak with anyone who may reside in this area who could have heard or seen suspicious activity between the time periods listed. It is expected that the method of entry would have generated significant noise. Anyone with information is encouraged to call the Mackay police station on 0749 683 444 or you can contact Crime Stoppers on 1800 333 000 any time of the day. The police reference number is QP1701906011. 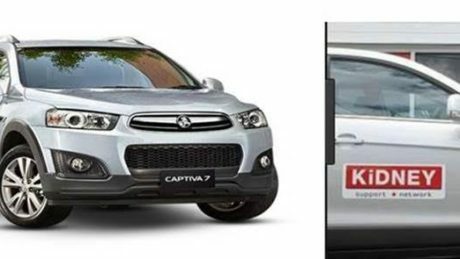 Between Monday October 30 at 9:30pm and Tuesday October 31 at 5:50am unknown offenders have allegedly stolen a Silver 2016 Holden Captiva Wagon with Queensland registration 768WYA. The vehicle was parked in the garage of a building on Shakespeare Street, Mackay. If anyone has information that can assist police with their investigations please contact Crime Stoppers on 1800 333 000 or Policelink on 131 444 and quote police reference number QP1701905626. Police have charged a 35-year-old man with a number of offences following an alleged violent incident in Airlie Beach on October 28. Around 11:15pm, a male patron was evicted from a licensed venue on Shute Harbour Road after allegedly throwing a glass that struck another patron’s face. After security providers walked the man outside of the venue, it’s further alleged that he punched a nearby business sign and then picked up a metal billboard and threw it, striking a parked car. Police officers approached and while arresting the man, it’s alleged that he kicked a female police officer to the stomach while resisting police violently. The 35-year-old Cloncurry man has been charged with wilful and unlawful damage, unlawfully assaulting a police officer, unlawfully obstructing a police officer, and committing a public nuisance at a licensed venue. He is scheduled to appear in the Proserpine Magistrates Court on November 13.